The new season kick-off meeting of September featuring Joe Caparetta was a great success. Joe’s topic for the evening was “Unique Corals You Can Keep.” We had “technical difficulties” with the PowerPoint presentation, so Joe had to “wing” it and just talk about keeping marine corals, fish and the proper maintenance to sustain these livestock. The Q & A went on long after Joe went off camera. Everyone enjoyed this very different type of presentation. October brings our Fall Giant auction featuring marine fish and corals, freshwater plants, fish and invertebrates. As always, we will have many bags of your favorite species. Great bargains will be available, so make sure you come to the greatest auction in New York on October 14th. Our unique sales tables will be open for shirts, hats, books, magazines and other aquarium equipment and supplies. We will also have a giant raffle for our members and guests. I hope to see everyone at our October 14th event. As always, there is free parking and free refreshments. Please visit our new website where you can read the Bulletin and enjoy a full color Aquatica. So far, feedback has been very favorable. We put a lot of effort and hard work into this new web site and we want your reaction as to how you like it. Please get back to me on this. The interactive forums and sponsor sections are truly enjoyable. Provided you have given us your email address, you will be getting notifications of club events via email. I am asking for your help and support. If you want to see different speakers or try different things, please let me know. The elected officials of the Brooklyn Aquarium Society are here to serve YOU! Please let us know what you want and why. It would be helpful to everyone. It is important that you visit and patronize our sponsors. It goes full circle: by helping them, they are also helping you as hobbyists and everyone is helping the Brooklyn Aquarium Society, so help us, help you! On a more personal note – Any member who desires to attend a Board meeting, held at the Education Center of the New York Aquarium on the 1st Friday of the month, please notify me at (718) 238-1792 by the Tuesday previous to the meeting. Come spend the weekend with New Jersey’s largest Tropical Fish Club. The event includes a Vendor Expo on Friday and Saturday, as well as a fish show Saturday also, and a giant tropical fish, plant and dry good auction on Sunday. There will be multiple vendors Friday & Saturday, silent auctions, food and drinks available all three days. Visit www.njas.net for more info. Like Blue Zoo Radio? You’ll love Blue Zoo TV! Following a successful award winning season of Blue Zoo TV presented by HIKARI, where an ADDY Award for 2010 was presented to the show for “offering a great promotional tool and entertainment value to the web”. Blue Zoo TV is back for the 2011 season. The first show, “Cleaning a Pond” visits master breeder and in-home fish room aquarist, Charley Grimes. “Cleaning a Pond” reflects over 4600 emails to Blue Zoo asking to illustrate the subject. The show covers the cleaning at a “high rate of speed”. to add some entertainment value to a sometimes mundane job. To view the new show on Blue Zoo TV presented by HIKARI, go to http://www.bluezootv.com/ and click “Cleaning the Pond”. New episodes will be released every week to ten days for the remainder of the season. Blue Zoo TV would also like to thank Hikari, Kordon, Tunze and OnederSave for their continued support as well as our listeners, viewers and fans. Great food, great people, great place…ONE GREAT EVENT!!! Happy Summer! At our last meeting before our summer break, we had our election of officers. Most of the people in their current positions stayed the same, with a couple of exceptions. Adam Engerow had to leave his post as Corresponding Secretary for personal reasons due to college demands and Lita Goldberg went from Board member to the Sgt. At Arms position. We wish Adam great success with his academic endeavors and Lita much praise in accepting her new position. Our June event had Carol Ross of our sister club – Bucks County – in from Pennsylvania to provide a presentation on “Collecting Fish In Peru.” Carol’s presentation brought out the vast beauty in the untouched areas of South America , but also highlighted the lack of modern conveniences and that life is, at times, just bare necessities. It was an in-depth look at how people and businesses exist in that part of the world. The next time we shall meet will be at our birthday party at the NY Aquarium on July 8 starting at 7:00 PM. Please remember that this party is by invitation only. When your reservation invitation card has been received you and your party’s names will be listed at the entrance to the party. If you need to change a name for an attendee, you must contact me immediately so I can change the name on the list. If the attendee’s name is not on the list at the entrance to the Aquarium, they will not be allowed to enter! If you cannot make the party, then we will get together again at our September 9th event featuring Joe Caparette. His topic for the evening will be “Unique Corals You Can Keep.” As always, there is free parking and free refreshments. Please visit our new website where you can read the Bulletin and enjoy a full color Aquatica. So far the results have been very favorable and we put a lot of effort and hard work into this new web site and we want your feedback as to how you like it. Please get back to me on this. The interactive forums and sponsor sections are truly enjoyable. Also you will be getting notifications of club events via email. I am asking for your help and support. If you want to see different speakers or try different things, please let me know. The elected officials of the Brooklyn Aquarium Society are here to serve YOU! Please let us know what you want and why. It would be helpful to everyone. It is important that you visit and patronize our sponsors. It goes full circle, by helping them, they are also helping you as hobbyists and everyone is helping the Brooklyn Aquarium Society, so help us, help you! Write to City Hall today to urge them to protect Bronx Zoo and New York Aquarium funding. On May 5, 2011, City Hall released a proposed budget slashing funding for the Bronx Zoo and New York Aquarium by more than 50 percent. If passed, this could force layoffs, program cuts and hurt local merchants and small businesses in New York. Each year, while four million guests and students at Wildlife Conservation Society parks learn about the wonders of wildlife, they pump more than $316 million into the City’s economy, creating jobs for New Yorkers, supporting small businesses and generating tax dollars for our city. Lawmakers face an incredible number of competing demands during budget season. That’s why we need to let them know that New Yorkers care deeply about our zoo and aquarium and that we’re paying close attention to their next move. Cultural organizations like these are essential to the economic lifeblood of New York City. We know that cities and states across the country are trimming budgets and reining in spending, but cutting funding for organizations that create jobs and generate hundreds of millions of dollars is simply not the answer. Tell City Hall to save funding for cultural organizations like the Bronx Zoo and New York Aquarium today! May brought in more than just flowers; it brought in hordes of aquaria aficionados! What a great turnout for our Giant Auction, and rightfully so! We had almost 250 items up on the block – from aquariums, lighting, filters, CO2 tanks, protein skimmers, R/O units and the livestock! There were bags of rare and hard to find items such as Centopoma ansorgi, multiple types of synodontis catfish (some even I didn’t know about), dual snout elephant fish, mudskippers, dragon fish, mouth brooding severums, scores of African and American [North, South & Central] cichlids, marine fish, hard and soft corals and countless bags of various plants. This was undoubtedly the greatest auction of aquatic products that I have seen in the past 10 -15 years. If you missed it, well, shame on you! Our final event of the season will bring Carol Ross in from Pennsylvania. Carol’s topic for the evening will be “Collecting Fish In Peru.” Our great cory catfish expert Ian Fuller must have seen Carol’s presentation, because he is going on a collecting trip to Peru this summer – that speaks volumes. Doors open at 7:30 PM on June 10, so be there! June is also elections for Officers and Board members. Without these selfless and dedicated people, you would not have a Brooklyn Aquarium Society. There will be several empty slots this year as some of our long time members will be moving. – please get actively involved in YOUR club. We need your help if we are to survive for another hundred years. As always, there is free parking and free refreshments. Please visit our new website where you can read the Bulletin and enjoy a full color Aquatica. So far, the results have been very favorable. We put a lot of effort and hard work into this new web site and we want your feedback as to how you like it. Please get back to me on this. The interactive forums and sponsor sections are truly enjoyable. Also, you will be getting notifications of club events via email. Our Birthday Party is set for Friday, July 8, starting at 7:00 PM at the NY Aquarium. We will have Bar B Q style food, a sea lion show, pretzel, popcorn and ice cream carts, dancing under the stars, a complete new and vastly remodeled aquarium to ourselves and don’t forget the fireworks – after all we do have something to celebrate. Due to security reasons, this party is by INVITE ONLY! If you do not submit the invitation, then you will not be on the list and if you’re not on the list YOU WILL NOT BE ALLOWED IN! By now, your invitation should have been mailed back to us; there will be no tickets to this event – your names will be checked at the NY Aquarium entrance door, if you responded and mailed the RSVP ticket with your check or money order. As per title, our supporters at Omega One have a photo contests of their own. Submit your photos (up to 5) to customercare@omegasea.net and win a 1-year supply of some of the best fish food out there. 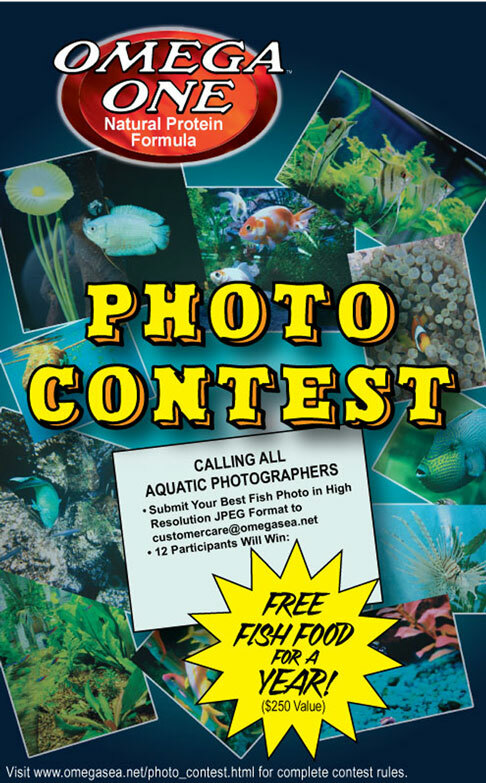 Head on over to http://omegasea.net/photo_contest.html to see official rules and requirements. Good luck. The Brooklyn Aquarium Society’s 100th Birthday Party will be by invitation only. If you are not on the list you will be turned away. There will be no ticket sales on the day of the event (July 8, 2011 7:00PM to Midnight). Tickets are $50.00 each with a 10% discount for 5 tickets or more. Anyone wishing to attend please email Joe Graffagnino at JoeGraffagnino@yahoo.com, with your name and mailing address so an invitation can be mailed to you. Response, with full payment, must be received by May 15th and the full names of all attendees must accompany the response. Marineland Stealth and Stealth Pro Heaters Recalled! United Pet Group (Marineland) has issued a voluntary recall of approximately 1.2 million Marineland aquarium heaters due to fire and laceration hazards. UPG states in their document that a wiring problem can cause the heaters to overheat or break during normal use. Overheating could cause the heater to catch fire or shatter or cause the aquarium glass to break. Leslie Harris was our April flower. Leslie hails from California and has worked and studied marine invertebrates for many years. Her unique topic for the evening was titled “Life Styles of the Wet & Spineless.” Leslie’s slide presentation identified the beautiful, yet savage world of these sightless creatures. Many aquarists questioned the process of maintaining of these types of creatures in their home aquariums – the obvious answer is very carefully! Leslie’s topic and the way it was presented was both educational and entertaining. For the month of May, we will have our Spring Giant Auction. No speakers — just great bargains for freshwater fish and plants and marine fish and corals. Our sponsors and members take out all the stops to bring you the best in fish, plants and aqua-cultured corals. We will have rare and hard to find livestock and dry goods. You want aquariums, canopies, filters, lights, aquarium accessories? — then come on over. Put it on your calendar for a do-not-miss event – May 13, doors open at 7:30 PM at our regular meeting place – NY Aquarium Education Hall. As always, there is free parking and free refreshments. Please visit our new website where you can read the Bulletin and enjoy a full color Aquatica. So far the results have been very favorable. We put a lot of effort and hard work into this new web site and we want your feedback as to how you like it. Please get back to me on this. The interactive forums and sponsor sections are truly enjoyable. Also, you will be getting notifications of club events via email. I hope that you have enjoyed the Northeast Council Convention in Cromwell, CT. at the end of March. As you know, the NEC selected the Brooklyn Aquarium Society’s theme of “100 Years of Advancements In The Hobby.” We had our booth there and entertained the audience and convention members with antique aquariums, books and stories. We sold our latest T-shirt there featuring John Todaro’s winning design of the 1911-2011 logo. Being the oldest club in the United States is something that we are very proud of and it’s something that you should be proud of also. Our Birthday Party is set for Friday, July 8, starting at 7:00PM at the NY Aquarium. We will have Bar B Q style food, a sea lion show, pretzel, popcorn and ice cream carts, dancing under the stars, a complete new and vastly remodeled aquarium to ourselves and don’t forget the fireworks – after all, we do have something to celebrate! Invitations are literally in the mail, so please send in your acceptance no later than May 15. Due to security reasons, this party is by INVITE ONLY! If you do not submit the invitation, then you will not be on the list; if you’re not on the list, YOU WILL NOT BE ALLOWED IN! This message might be outdated. Check here for current message and archives. These pictures say it all, enjoy!